Background: Although biliary tract injuries are lethal, many difficulties in identifying it have been encountered during laparoscopic surgery. We report a novel method of biliary tract identification using an endoscopic device with fluorescent imaging of indocyanine green. Method: During operation 1.0-2.0 ml of 0.25% ICG had been intravenously injected in a patient with multiple liver cyst and 4 patients with acute cholecystitis. Intraoperatively, the bottom of deroofing liver cysts and hepaticoduodenum ligament including gall bladder were observed using a charge coupled endoscopic device with a cut filter as the detector, and light emitting xenon below 800nm as the light source. Result: Common bile duct (CBD) and intrahepatic bile duct (IHBD) in the liver cysts wall bottom were clearly visualized and was easily and accurately identified after being fluoresced, where as the localization of bile duct was not visible under naked eye as a green spot. 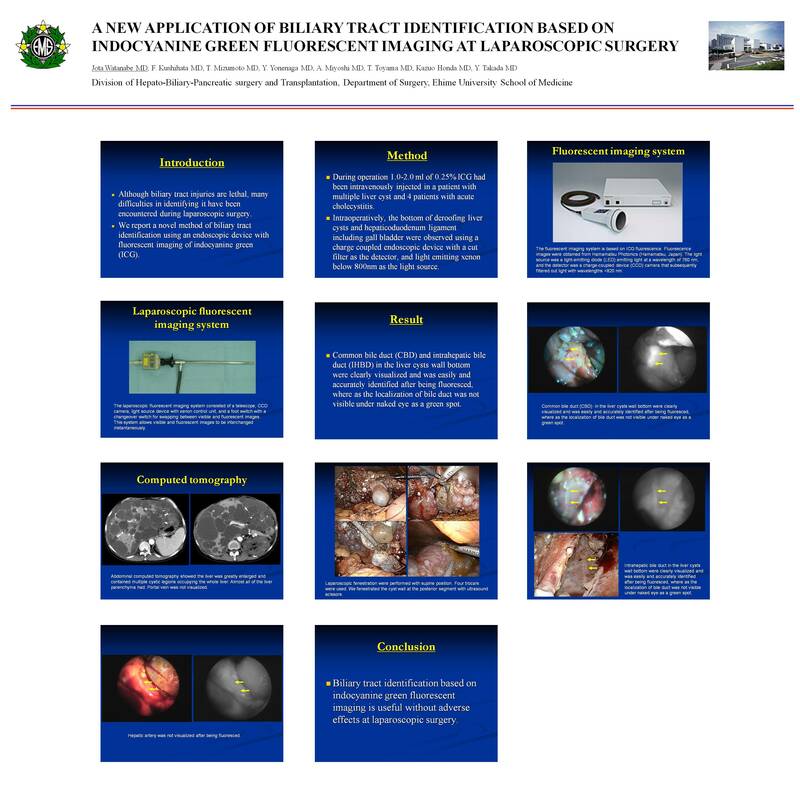 Conclusion: Biliary tract identification based on indocyanine green fluorescent imaging is useful without adverse effects at laparoscopic surgery.